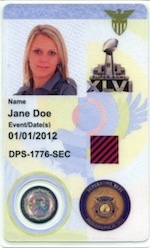 The U.S. Government Printing Office designed and printed an FBI special events credential that was used at Super Bowl XLVI in Indianapolis by public safety personnel. GPO produced approximately 10,000 of these credentials at the agency’s production facility in Washington DC. The special event credentials were issued to approved public safety and security personnel from local, state, and federal agencies who required access to secure areas during major special events. A GPO spokesperson could not say whether any technology was embedded in the card for additional security or if it was used as a flash badge. GPO also produces other credentials for the federal government including Trusted Traveler Program cards for The Department of Homeland Security’s Customs and Border Protection and the nation’s passports for the Department of State. GPO has also been certified by the General Services Administration to provide PIV services to federal agencies.